And 76 million of those Catholic believers reside in the United States, making up 23 percent of the American population. In the United States, Bible ownership is common among practicing Catholics; 96 percent say they own a Bible. But Bible engagement is not as prevalent. Although 66 percent of practicing Catholics say they read the Bible at least three to four times a year, that number drops to 40 percent when including nominal Catholics. Yet 77 percent of practicing Catholics say they want to read the Bible more, which provides a unique opportunity to equip Catholics to engage with the life-changing message of God’s Word, while simultaneously honoring the longstanding traditions of the Catholic Church. Scripture resources created in collaboration with the Catholic Church are key to increasing Bible engagement within the Catholic community. One flagship resources for Catholics is “Lectio Divina,” an ancient exercise of Bible reading, meditation and prayer. This resource, which is made possible thanks to American Bible Society’s financial partners, helps Catholics engage with Scripture through “Lectio Divina” training sessions, printed guides and digital Scripture journeys. 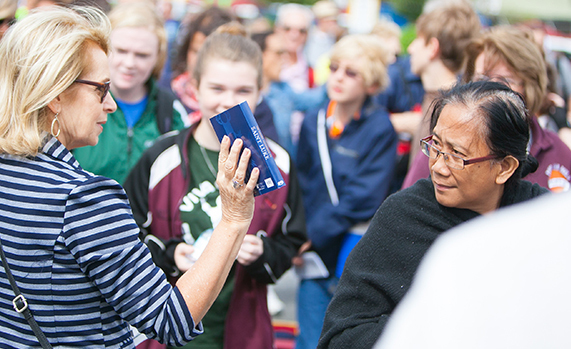 And through partnership with the Catholic Church during large Catholic events, such as World Youth Day and the World Meeting of Families, Catholics of all ages, and from every corner of the globe, have access to easy-to-use resources for Scripture engagement. Please pray that leaders of the Catholic Church would continue to draw upon God’s Word as they lead and nurture their flock. Pray that ancient methods of Scripture engagement, such as “Lectio Divina,” would help a new generation of Catholics encounter God in his Word. Ask God to bless and guide the growing relationship between American Bible Society and the Roman Catholic Church.